Exercise wise, things are great. I make sure to run or do at home workouts while traveling and when home I walk nearly 4-5 miles/day plus do a yoga class. Still, I feel less like myself. Really I don’t think the scale had moved up more than 2 pounds but you can easily tell when your jeans are snug or if your body isn’t looking the same in the mirror. Most of the time, it’s the small choices that add up; too many times I’ve said yes to fries instead of a salad or indulged in a treat even when I wasn’t hungry after a meal but simply because I could. I hate when I convince myself the opposite of my true intention. It’s all about the commitment to living a healthy, balanced life and I need to remind myself of this throughout my day and especially when it comes to how I nourish my body. While I still consider myself a healthy person, I love opening up and sharing these thing with you because it makes me feel more accountable towards my health goals. What are those specific goals you ask? To eat more vegetables and less refined sugars, to build more muscle and to indulge every once in a while. Overall, my food choices just need a bit of an adjustment and I’ll be using the rest of April to make sure I’m doing just that. 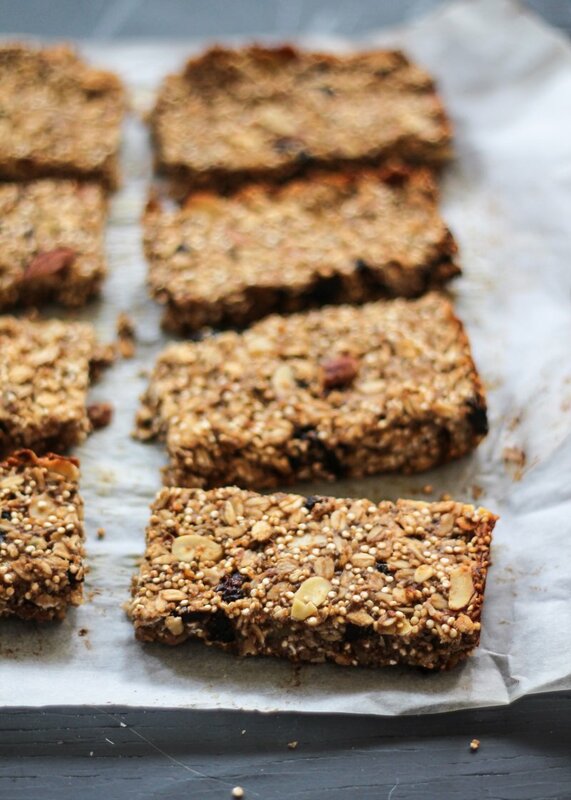 As a result, I made these granola bars for an afternoon snack. They are above all my favorite granola bar yet because of all the fun ingredients like oats, quinoa, fruit, nuts, chia and hint of banana flavor. Plus they don’t break the bank. Honestly they’re incredibly filling, similar to how you feel after you eat one of those giant Clif bars yet they won’t weigh you down. In the meantime, I’d like to invite you to follow me on Instagram where I’ll be sharing my healthy meals and snacks as a part of my health goals for April. I’ll hashtag everything #AKhealth too so you can see in detail the meals in consuming, workouts I’m doing and read along as I document my progress. xoxo! Preheat oven to 350 degrees F. Line an 8x8 inch baking pan with parchment paper to prevent bars from sticking. In a large bowl, combine oats, uncooked quinoa, chia seeds, salt and cinnamon. Stir in mashed banana and vanilla. Fold in almonds, pecans (or walnuts) and dried fruit. Place a small saucepan over low heat; add in almond butter and honey (or maple syrup) and stir until warm and almond butter is melted. Fold into granola bar mixture until well combined. 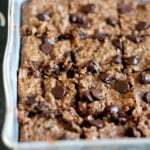 Pour into prepared pan and press down firmly with hands or with a measuring cup to help bars stay intact. Bake for 25 minutes or until edges turn golden brown. Allow to cool completely before cutting into 10 bars. I cut mine into 8 originally and they were much too filling for a snack, so I reduced the serving size to 10. 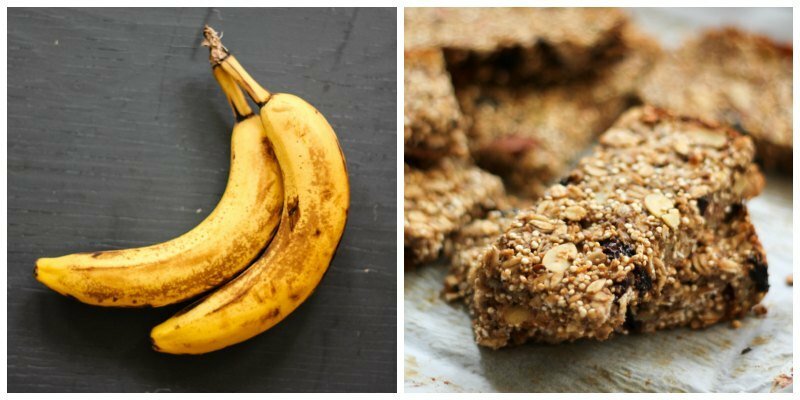 110 Responses to "Chia, Quinoa & Banana Granola Bars"
These look so great! I’ve been looking for a good granola bar recipe. I’ll try making these this weekend. I mean, this is just me, but I think you look fantastic. So fit, muscular and toned and slim in all the right places. But I completely understand that more internal feeling of “oof, so much eats.” These granono bars are a great way to get back on track. But seriously. Girl look at that body. I can relate to this post 100%. I also feel like I need a slight adjustment in my eating…over the past week or so, I feel like I’ve indulged a bit more than I’m comfortable with. 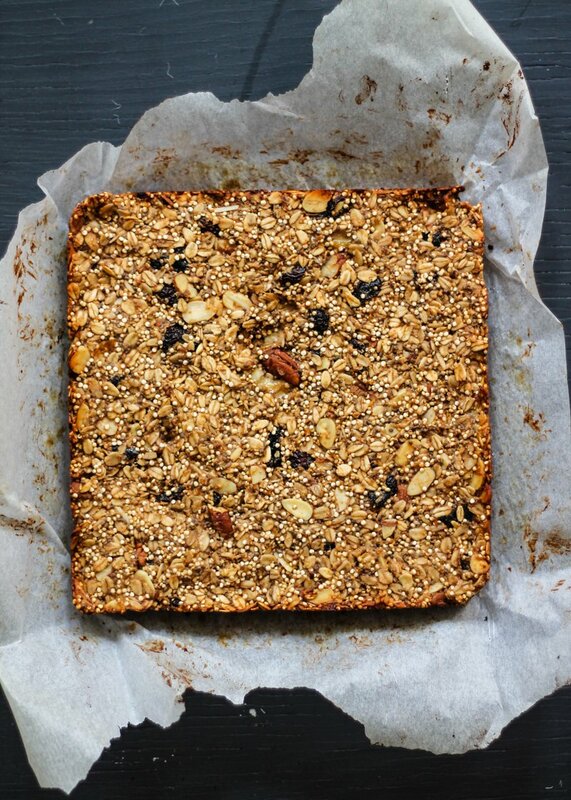 These bars look like the perfect way to get back on track! After a couple of trips – and too much ice cream – I just told myself the same thing this morning! Time to get back on track. I feel you on the whole not eating too well lately. I love how open you are about it because it’s a reminder to me that I just need to acknowledge my weaknesses and DO SOMETHING about it. 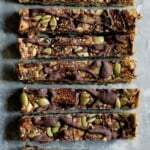 These granola bars look amazing. Need to try these soon! Wow, these look super tasty! Seems like all of the nuts and grains would provide some nice crunch. Guess what’s in the oven right this very second? THESE granola bars!! Your post moved me so much, that I wanted to do even the smallest thing to get back on track for healthy eating and snacking stat! It’s hard enough for me as it is to try and stay healthy, and then traveling on top of that? Girl that is just so tough!! Thanks for another amazing recipe and for inspiring me to up my healthy game! I did enjoy them! I made them with dried cherries, and the tartness was a great compliment to the natural sweetness of the other ingredients! I also wanted to let you know that these freeze really well. After making them I let them cool completely, then I wrapped them individually in plastic wrap and put them in a freezer ziplock bag. Then in the mornings when I want a granola bar I just take one out and let it come to room temp on the counter, so delish!! Made these last night and they are SO SO yummy! 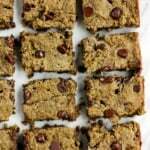 Thank you for such a delicious and healthy snack bar recipe. Most I’ve found are filled with sugar and not so healthy ingredients, but these are perfect and absolutely delicious! My 13 year old has made these twice and I took them into the gym and was promptly asked for the recipe. 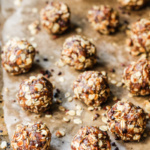 Really good; I like these better than the peanut butter date ball recipe floating around on web as these are not as sweet! Do you think if I used blueberries instead of bananas it would work as well? Would it still hold up without any nut butter or nuts? My son is allergic to nuts and trying to figure out granola bars he can eat. 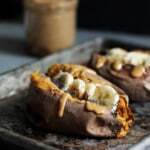 Although I haven’t tried it, you could possibly use sesame butter in place of almond butter. As for the nuts, maybe things like coconut flakes and more dried fruit would work. Chia seed meal is excellent for keeping things together when mixed with water or even applesauce. It’s also an excellent source of protein. Is it possible to sub the banana for grated apple or pear? These are tasty but I’m wondering about the pre-rinsed quinoa? Was I supposed to soak them for a while rather than just rinsing them under the tap? I ask because they seem too crunchy and it’s my first time baking with quinoa. My same question! Is the quinoa really uncooked or most it be soaked? I want to make these today but wondering…. Can someone tell how much each bar weighs in grams? Love these for a healthy snack! Sort of tastes like banana bread! I used walnuts instead of pecans, and sliced almonds instead of chopped almonds. Also, I used Trader Joe’s dried, unsweetened cherries. I also only used about 1.5 bananas instead of 2 because that 1.5 filled 3/4 cup mashed. 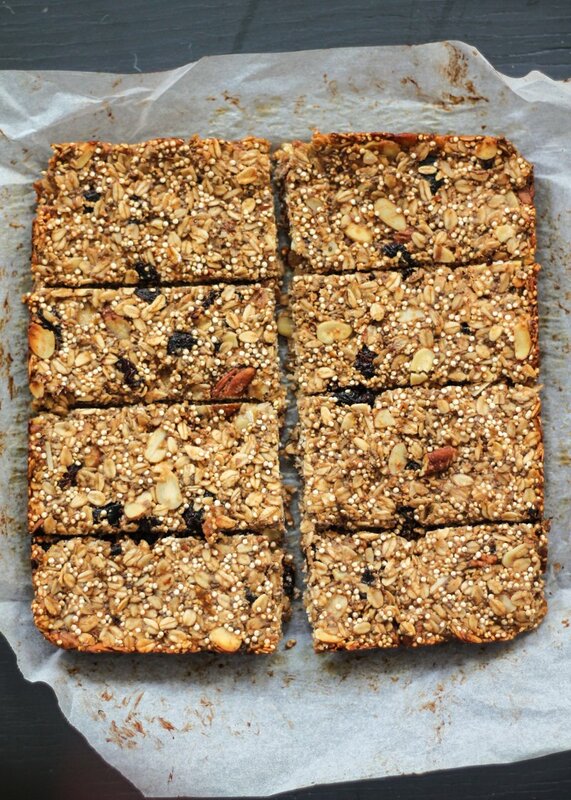 I could see toasting the quinoa and oats like in the Peanut Butter Quinoa Granola bars also on Ambitious Kitchen for a crunchier texture. They are in the.oven rt now, can’t wait to taste them. I made a double batch so I can freeze some. I made them w red quinoa, the mix looked real pretty. Thanks for the recipe. Hi, thank you for your delicious and healthy recipe! We tried these, froze some, and have been enjoying for the past couple of weeks. I partly made them for my toddler who loved them! But after seeing whole seeds of quinoa in his diaper (sorry to talk potty on a delicious food post! ), I went online to see if raw quinoa can be digested. I discovered that the seed (not a grain?! Wow!) has a very hard outer shell and when eaten unsprouted/uncooked, it cannot be digested. Based on my toddler’s diaper, it seems that baked quinoa cannot be digested. Can you shed any light on what you might know with your recipe that I don’t? Thanks!! I think I would prefer dates to bananas. How much should I use? I made these yesterday, using cut up dried apricots (that’s what I had in the pantry) and they are amazing. Thanks for the great recipe. I needed a school snack that was braces friendly. These work. I changed peanut butter to sunbutter since my son has a peanut allergy and omitted the nuts for the same reason. Added coconut and ricechex for a little crunch. these were very easy to make and less expensive than store bought. Thank you! Just would like to know for how long it lasts on the freezer? I’ve just made it for second time 4x recipe to freeze. Yum! Thank you for this recipe. It was easy to make the the littles and we all enjoyed it. Used cranberries and subbed pumpkin seeds for the pecans. Hi! Just seeing these now on Pinterest and they look lovely. I would need to use something other than oats. Any thoughts? Thanks so much for all that you do! Would this work with cooked quinoa? Uncooked quinoa can’t be digested. Would this work well with cooked quinoa? It’s a seed that cannot be digested without being cooked. I wondered if I should cook the 1/2 c quinoa first and use the whole cooked amount, or should I use only 1/2 c cooked? Hi Kathy! I wouldn’t recommend using cooked quinoa, as it would be too moist for this recipe. 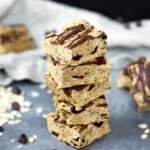 You could try adding oats in, or try out these bars instead! I just found your great site and I love it. Hi Elle! So glad you love this one. The dried fruit (rather than fresh) helps the bars stay together and crunchy, so I’d stick with that! Fresh fruit just adds a bit too much liquid. These are amazing! They were very fast and easy to put together and the results are delicious. I love the crunchiness and, like another reviewer mentioned, using cherries added a nice tartness. I am finding it quite difficult to not eat the whole pan. These looked too good not to try! I had to make some substitutions to use things I had and they still came out perfect! I ended up replacing the nuts with cashews, pumpkin and sunflower kernels. Then instead of regular nut butter i used some PBFIT peanut butter powder i picked up the other day. Delish! Oh and used dried figs to use them up. Also broke mine to 16 bars because it was easy to cut evenly and kept them to 107 calories. I often need low calorie ways to increase my protein because I often don’t get enough in a day. Glad you enjoyed these, Aimee, and that you found some subs that worked for you! These are so good (and smelled incredible while making them)! I’m used to commercially produced, much more sugary granola bars, so the first few bites of these were a bit of a surprise to me, being less sweet and a different texture (not that they’re not sweet! It’s just more subtle) – but I’ve already been back for seconds and look forward to bringing these to work for my mid-morning snack this week! Wow that sounds great! Glad you enjoyed! Can I use regular butter instead of almond butter? 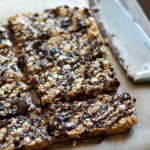 I wouldn’t recommend it – the almond butter helps to bind these bars together. It’s healthy, but the bar itself tastes pretty dry. I’m going to try to find another recipe. Made these today. Very good!! Now to stop myself from not eat them all today! Do you think millet would be ok to use in lieu of quinoa?